The main objective set by the Federation Roadmap is to define, based on the analysis of the existing internet policy initiatives, how the collaboration (federation) between the GIPO Observatort Tool and these initiatives could happen, and how it can be implemented (roadmap). The final collaboration approach is a result of findings of the survey performed among mapped stakeholders. The final collaboration approach is a result of the on-going stakeholders´ feedback (including findings of the survey performed among mapped stakeholders). leveraging their work and network. And that is why the federation roadmap is so important. The GIPO´s Observatory Tool core services are managed centrally by the core team that runs, maintains and evolves the service. Intermediaries display the information and provide sources. Other stakeholders use GIPO as a source of information and provide content. he service is provided through 3 technological options (RSS, API, Dashboard), corresponding to different skills levels. However, the main priority is to be useful for small, resources-scarce organisations. Organisational collaboration, including common conceptual collaboration; common events, trainings and courses; and cross-communication and common promotional activities. Technological collaboration, in terms of the integration of services / re-syndication of content. Focusing on leading conceptual collaboration and building dialogue between observatories through common events. Focusing on partial interoperability short term (promoting the Dashboard as a first step of technological collaboration), and full interoperability (API) in the long-term. To conclude, it is fair to say that the GIPO Observatory Tool progressed greatly within the last year. Nevertheless, there are still challenges that GIPO needs to leverage in the future, both in collaboration with the observatories as well as other stakeholders. In particular, the GIPO Observatory Tool should focus efforts on further uptake of the dashboard by IG stakeholders. 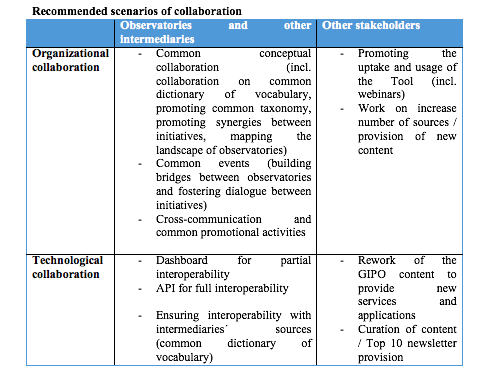 There is also a potential for the GIPO Observatory Tool to lead the discussion on: 1) semantic interoperability of the intermediaries (common dictionary of vocabulary) and 2) mapping and connecting the ecosystem of IG initiatives. Finally, the GIPO Observatory Tool is at the stage where it can reach out beyond intermediaries, to other stakeholders and promote the uptake of the Tool by IG experts, engaging them into provision of sources, or developing further dedicated GIPO´s Tool functionalities. Download the full Federation Roadmap II for further ideas and results of the survey here.